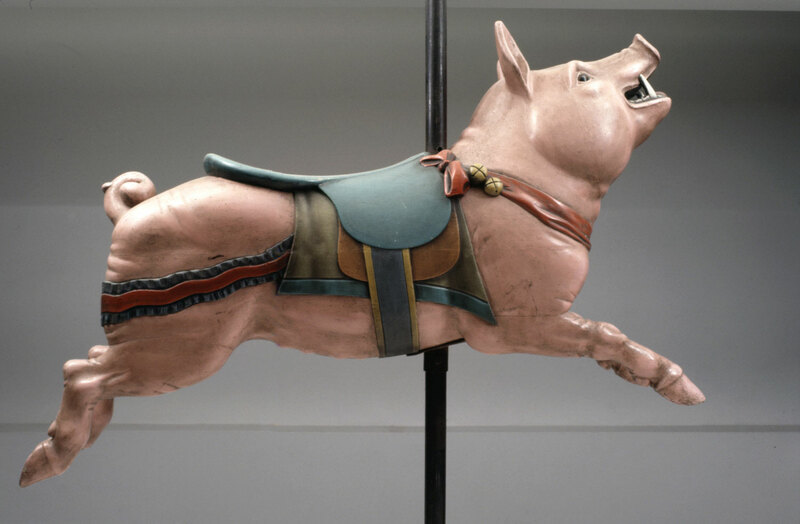 While the first "flying coaches and horse" in North America were built in Philadelphia in the mid-eighteenth century, more elaborate carousels composed of lavish, brightly painted figures such as this pig grew in popularity during the Victorian era. One of the largest and most famous examples was built for Woodside Park in Philadelphia by the Dentzel Carousel Company in the 1890s. Gustave A. Dentzel, an immigrant from Kreuznach, Germany, established his shop at 155 Poplar Street in Philadelphia in 1887, advertising his skills as a "steam and horse power caroussell [sic] builder." His reputation for supplying the finest amusements decorated with ornately carved animals grew quickly, and his factory expanded into larger quarters in the Germantown section of the city where it operated until 1928. Dentzel employed a number of highly skilled immigrant craftsmen from Germany and Italy to produce his carousels. The Museum's pig is attributed to the Italian-born Salvatoré Cernigliano, who is known to have made a number of the more whimsical animated figures incorporated into the factory's assembled menageries. Jack L. Lindsey, from Philadelphia Museum of Art: Handbook of the Collections (1995), p. 296.